If you have listened to any news or looked online in the last few weeks, you will have seen the word Windrush everywhere. In this blog, we will look at what Windrush is or was and why it is causing such controversy today. After World War II, the British Isles needed rebuilding. There was damage to the buildings, cities and towns in Britain. The male population was also reduced due to the losses of the war, so there was a need for labour to rebuild. To help rebuild, the government invited people from the Caribbean to Britain. 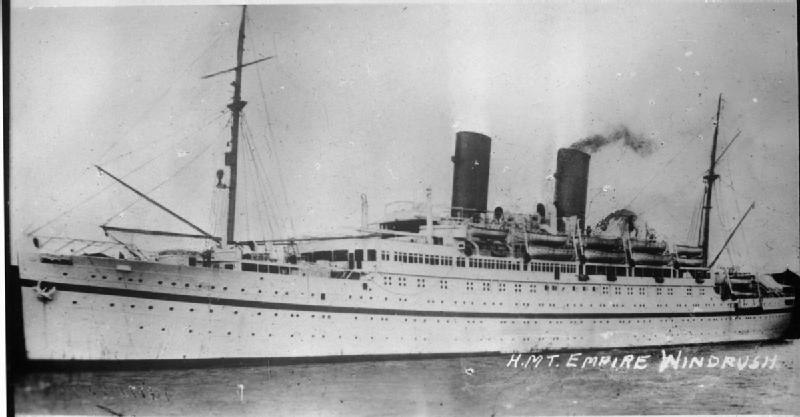 The Empire Windrush (above) was a passenger liner and cruise ship that was used during World War II as a troop ship. However, in 1948 it became even more important. During World War II, many Caribbean men and women had joined the armed forces, so when the Windrush stopped in Jamaica, many servicemen decided to make the trip to join the RAF. Many more young men joined them to come and help the country in some other capacity. Most planned to simply stay for a few years. And so it was that on the 22nd June that year, the Empire Windrush arrived in Tilbury in the UK. Contrary to expectations, the Caribbean migrants aboard would become an important part of British society, and in so doing, change aspects of British life. In 1948 housing was an obvious post-war problem, and it would continue to be for some twenty years. It meant there was a lot of construction work available to repair all the damage. However, although it did provide many jobs, for a long time it was this same lack of housing that would cause problems, as it led to conflicts between the Caribbeans and native British people. Alongside this conflict, other forms of discrimination began to take place. The people from the Windrush were excluded from much of the social and economic life around them. Many began to start their own churches. They became more heavily involved in institutions that they did have access to, such as local councils, staff associations and trade unions. West Indians became a more established part of British society. The Notting Hill Carnival takes place in streets where once they were attacked by crowds. The carnival was a celebration of the pleasure of being alive. As the Windrush people became part of British society, they began to play a role in what it meant to be British. So what has caused a problem today? In 1971, the Immigration Act gave Commonwealth citizens the right to remain indefinitely in the UK, but the government did not keep a full record of those individuals. Additionally, it has now transpired that thousands of the landing cards of Windrush migrants were destroyed in 2009 or 2010, meaning that records are no longer available to prove the right of affected individuals to remain in the UK. Furthermore, there have been cases of Windrush children, who are now adults and who have lived in the UK for decades, being threatened with deportation. Unfortunately, many children who travelled with their parents on the Windrush travelled on their parents’ documents, so did not necessarily have a passport to travel aboard. As they were not asked for documents, they now find it hard to prove they were on the Windrush. In response to the revelations on the issue, Prime Minister Theresa May has now met with the heads of 12 Caribbean countries. Over 140 MPs signed a letter demanding a resolution, whilst one hundred and thirty thousand people signed a petition to demand amnesty for immigrants who arrived in the UK between 1948 and 1971. Which brings the question: How many people does all this affect? The Migration Observatory at Oxford University has estimated that around 500,000 people in the UK arrived before 1971 from a Commonwealth country. Besides being asked to leave the UK, people from the Windrush have also been refused free medical treatment under the NHS as they have not been able to prove they are entitled to care. Labour MP and Chair of a parliamentary group on race and community, David Lammy, said in a letter to Theresa May “Our [Government] invited the Windrush Generation to Britain as citizens to rebuild our country in the wake of WWII. That these individuals are being treated with such contempt, disrespect and lack of dignity is shameful.” The Windrush generation brought a vein of culture into the UK which, along with other cultures, has led to Britain becoming a rich, multicultural nation. They also helped the existing British people to fight World War II and then rebuild after the War. It is hard to to disagree. Quibbling Siblings: How Competitive Are You With Your Sibling?